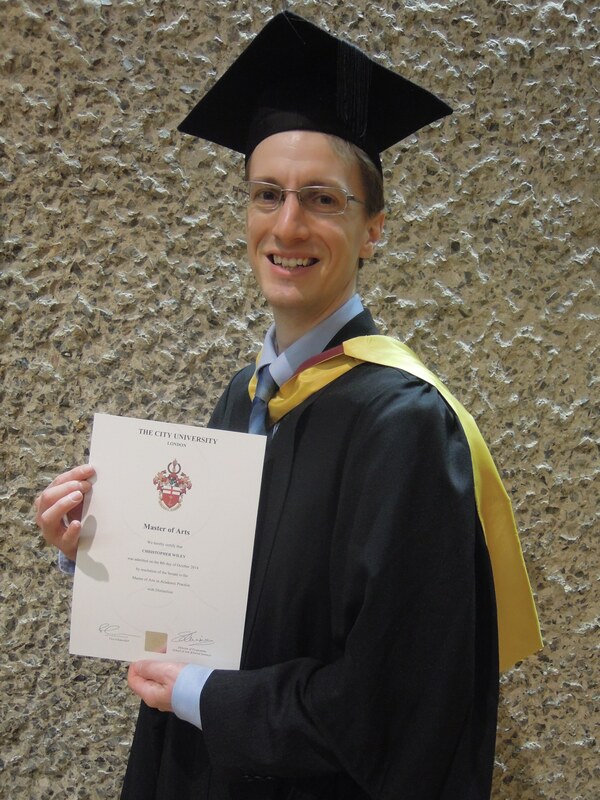 Dr Christopher Wiley graduated with a Master of Arts in Academic Practice from City University London at a ceremony held at the Barbican Centre, London on 28 January 2015. Dr Wiley was awarded the MA in Academic Practice with Distinction in October 2014, having studied the degree on a part-time basis from 2008 alongside his lecturing positions at City University London and latterly at the University of Surrey. Dr Wiley’s areas of study on the programme included Learning, Teaching, and Assessment; ICT in Higher Education; Curriculum Development; Personal Tutoring; Research Supervision; and Academic Leadership. 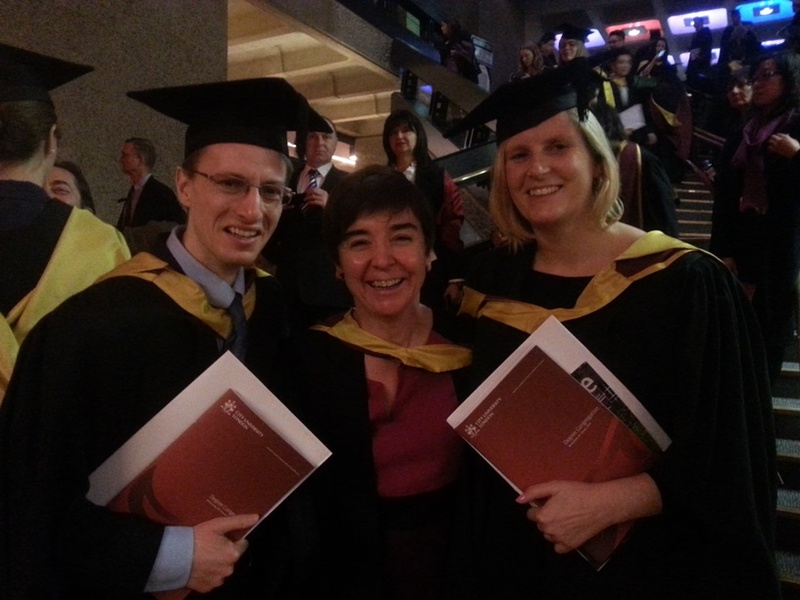 Pictured below: Dr Wiley with his fellow graduates from the programme, Sally Thorpe (centre) and Emily Allbon (right), both of whom are staff members at City University London. Dr Christopher Wiley has published an article on academic leadership in higher education in City University London’s in-house Learning at City Journal. Dr Wiley’s essay, ‘Academic Leadership in Learning and Teaching in Higher Education: A Personal Reflection on one Programme Director’s Professional Development’, provides a retrospective evaluation of his development as an academic leader to date, with particular reference to his previous position as Programme Director of City’s Music BMus programme (2009–13). Based on work originally undertaken for his MA in Academic Practice, the article considers change management, collaborative leadership, metric-based performance, and the challenges faced by the UK higher education sector today, as well as discussing the ways in which Dr Wiley has sought to apply theories from the scholarly literature to his various leadership roles. ‘Academic Leadership in Learning and Teaching in Higher Education: A Personal Reflection on one Programme Director’s Professional Development’, Learning at City Journal, Vol. 4, No. 2 (October 2014), pp. 39–49. Dr Christopher Wiley presented a lunchtime webinar hosted by ELESIG (Evaluation of Learners’ Experiences of e-learning Special Interest Group) on 24 April 2013. 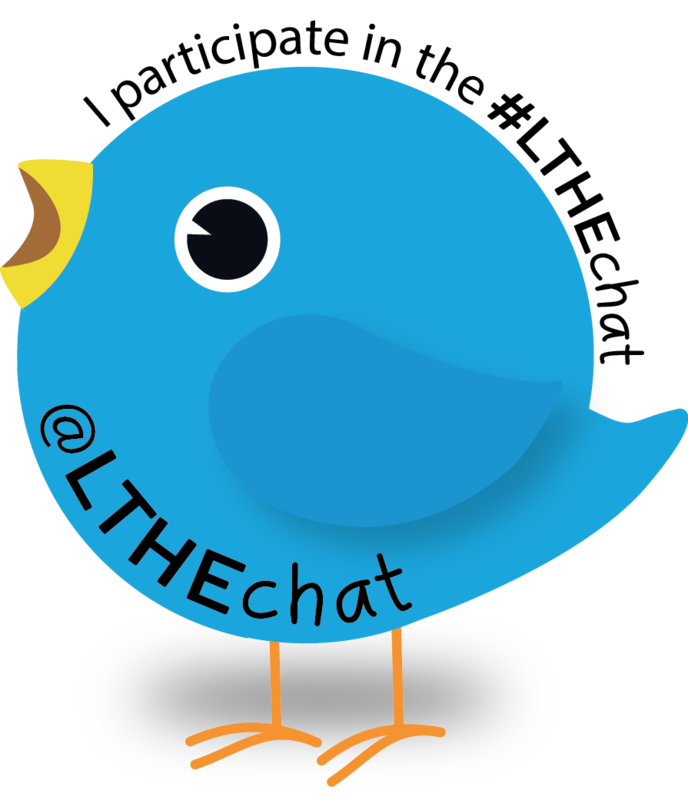 Entitled ‘BYOD, mobile technologies, and social media for learning’, the event was the first in the ELESIG Webinar Series 2013. In the course of the webinar, Dr Wiley discussed various ways in which he had sought to respond to students’ use of social media (including Facebook and Twitter) and their own mobile technologies in his teaching, in order to engage the students in e-learning and to enable them to contribute online as well as in person. Drawing on evidence received from both students and staff in recent years, Dr Wiley discussed the merits and shortcomings of using these innovative technologies to facilitate learning at the tertiary educational level, as well as its value in educating students in contemporary issues such as media literacy and management of their online identities. With over 50 members of the ELESIG community attending online from across the nation, much lively and productive discussion was prompted throughout the one-hour webinar.